Wind energy has been remarkably successful in providing an increasing share of cheap renewable energy. But can this trend continue to supply more and more renewable energy for decades to come? 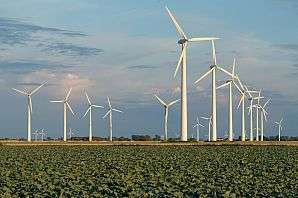 A new study published by scientists from the Max Planck Institute for Biogeochemistry in Jena, Germany, lowers the expectations of wind energy when used at large scales. How much wind energy can at best be generated? And how efficient are turbines going to be when more and more turbines are needed to generate more renewable energy? These questions were addressed in a study just published in the Proceedings of the National Academy of Sciences. Every turbine removes energy from the winds, so that many turbines operating over large scales should reduce wind speeds of the atmospheric flow. With many turbines, this effect should extend beyond the immediate wake behind each turbine and result in a general reduction of wind speeds. This wind speed reduction is critical, as it lowers the amount of energy that each turbine can extract from the winds. By accounting for this slowdown effect, the authors resolved a standing discrepancy between the high estimates for wind energy derived from local wind speed observations and small wind farms and the much lower estimates derived from large-scale estimates derived from climate models. Dr. Lee Miller, first author of the study, explains: "One should not assume that wind speeds are going to stay the same with a lot of wind turbines in a region. Wind speeds in climate models may not be completely realistic, but climate models can simulate the effect that many wind turbines have on wind speeds while observations cannot capture their effect." The wind speed reduction would dramatically lower the efficiency by which turbines generate electricity. The authors calculated that when wind energy is used at its maximum potential in a given region, each turbine in the presence of many other turbines generates on average only about 20% of the electricity compared to what an isolated turbine would generate. The researchers applied a global climate model commonly used in climate research. They performed scenarios of different wind energy use across all continents to find out how much wind energy could at best be generated. On land, they determined that only 3-4% of land areas have the potential to generate more than 1.0 watt of electricity per square meter of land surface, with a more typical potential of about 0.5 watt per square meter or less. These estimates are similar to previous climate model studies, but about ten times lower than estimates based on observed wind speeds. This strong discrepancy is explained by the substantial 40 – 50% reduction of wind speeds in the climate model simulations. As wind speeds disproportionally affect the electricity generation of wind turbines, the lower wind speeds result in the much lower wind energy potential obtained by climate models. Dr. Axel Kleidon, group leader at Max-Planck-Institute for Biogeochemistry, admits that these scenarios of wind energy are hypothetical. Yet, he sees the results as highly relevant for the future ex-pansion of wind energy. "We found these dramatic effects at turbine spacings commonly used in present-day wind farms on land." Kleidon plans to look into observations of present-day wind farms to see whether this effect can already be seen. This effect would imply that in order to maintain today's high turbine efficiencies and favorable economics, the future expansion of wind energy should probably proceed with much greater spacing between turbines than what is common to wind farms of today. what would large-scale implementation of "underwater windmills" do? In the end there shouldn't be one type of energy harvesting. A sensible mix of hydro, wave, wind and solar (with some biofuel) and storage should do the trick. It's not like countries need to endlessly build windmills. Once you're at 100% self sufficiency then there's no point in building more. I have been warning about this for years. But "science" devotees consistently called me crazy. Not a single on accepted what I said. A number even went so far in their determination to pretend like my statements deserved contradiction as to say conservation of energy didn't apply here. This was obvious from the start. "Science" devotees seem to see the purpose of "science" only to be to fail then get more government grant money to try again, or, if they don't fail at one thing, to do it, regardless of the obvious harm it will have elsewhere, then, when the harm can't be hidden, anymore, declare it a new catastrophe that needs handling. I also pointed out that windmills, by decreasing the work of the wind, among other things, cause air downwind of an installation to be warmer, and that is happening, too. What is the big deal? All we have to do is model the winds and put the turbines where they do not interact. No, this is not some kind of trick to get more research money. Is that how YOU live? Do you cheat like that? So, why do you assume others do? That would put the turbines so few and far apart that it wouldn't be worth the candle. That's the point. Fewer turbines, less electricity. The effect travels upstream. That's the lesson of the wind turbine study as well. Think of it like a traffic jam on a highway. If some of the exit ramps are congested, the cars have to go somewhere else or even stop entirely, and the whole highway flow changes. Self-sufficiency and renewable energy are at odds because a single country or state is too small for the intermittency. The smaller the country, the more you are relying on the "other" part of the equation. Maybe Russia could be entirely self-sufficient on renewable energy because it spans 11 timezones - they could get nearly round-the-clock solar power with a really long transmission line. and storage should do the trick. Which is the bulk of the trick. A related topic concerns wind turbine noise. A large array of turbines, when it slows the wind, which it does significantly if close spaced and operating at near Batz efficiency, creates self induced wind shear. This produces downwind sound attenuation well below the levels predicted by ISO 9613-2. For example an offshore wind farm close to a populated shoreline and upwind of it in the prevailing wind direction needs to take this into account with some competent ray-tracing. Wind power is cheap? Compared to what, solar? The issue is further complicated of there being different incompatible ways of quantifying 'cost'. rrander, check this out, then look into Hinkley. You are all so 20th Century!